Tournament Casting competitions are hugely enjoyable events, bringing together casting enthusiasts from across the world, who are interested in taking their casting ability to the extreme. You can achieve tremendous distances with your cast. Rod, line, timing and technique. When it all comes together, it is pure joy. We make our Bruce & Walker Tournament Casting rods with strengtheners and inserts to help them withstand the often unacceptable pressures they are forced to endure every time they are used. With any extreme sport, there is always a consequence. By the very nature of their use, Tournament Casting (TC) rods endure an inordinate amount of torsional pressure. Occasionally, they endure unacceptable amounts of pressure. They are being pushed to their very limits, and to destruction, every single time they are used. Nothing will withstand this continual abuse forever. The pressure that the carbons are forced to endure, when the casting is right, is phenomenal. When the casting is miss-timed, overloaded, miss-cast - the pressure is unbearable. To expect a carbon fibre fishing rod to survive such abuse, is, at the very least, unreasonable. You will find that most countries have their own Rules and Regulations regarding the lengths of TC rods; the lengths and weights and diameter of casting lines; and the size and type of reels. However, as a very rough guide, the maximum line weight on our Bruce & Walker TC rods is 15'/65 grams; 16'/70 grams, 18'/75 grams. The Bruce & Walker TC rods are guaranteed against manufacturing faults. They are not guaranteed against misuse, overloading, miss-timing of a cast, or being pushed over and above their capabilities. Enjoy your Tournament Casting sport. Perfect your tournament cast. But above all else, appreciate what you have in your hands. It is a carbon fibre fishing rod. Treat it with respect and it will reward you with pleasure. 1. 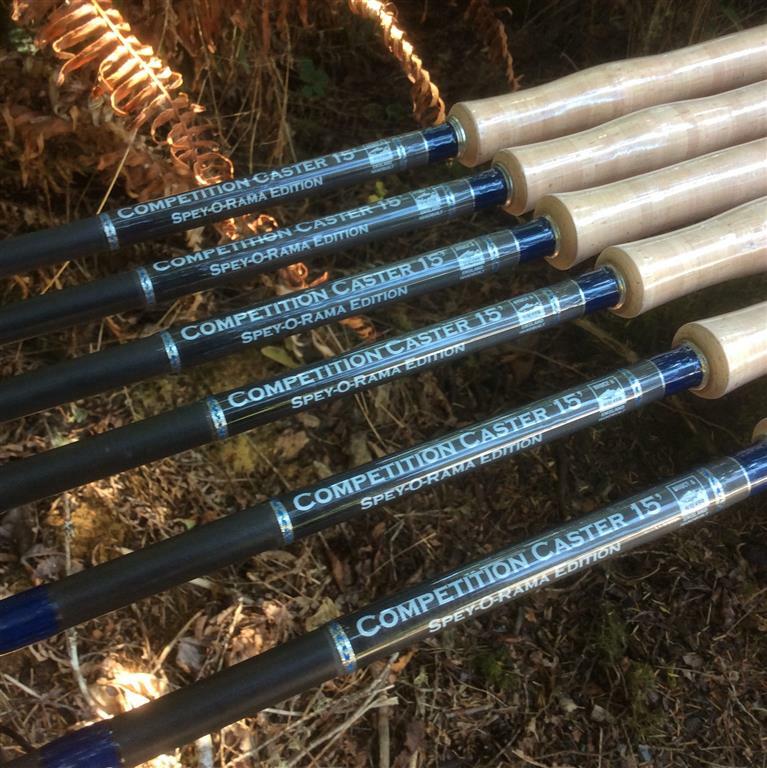 The Tournament Caster 15' and 18', (TC15' + TC 18') which are finished (as standard) in colours similar to our Powerlite Speycaster rods. But the TC 15' and TC 18' can be finished in colours of your own choice, if you wish. As long as we hold the colours you choose in house, there is no extra charge for this custom built service. 2. The Competition Caster Spey-O-Rama Edition rod, as standard is a polished carbon finish, with blue whipping, and silver tippings on the ends of joints. There is also a blue + gold tipping twist in the centre of the three ferrule end whippings on the top and middle sections. This is to reflect the club colours of the Golden Gate Angling Club of San Francisco, which holds the Spey-O-Rama Championships each year. The rod has a cork handle with a black reel fitting, and matching black end cap + rubber button. Again, can be finished in a colour of your choice, but painting a rod that is polished carbon as standard, would incur an additional cost. 3. The Norway Tournament Caster 15' rod is finished just like our Norway Speycaster range. It has a polished carbon finish, with black whippings, and a black reel fitting. It has a full cork handle, with a rounded cork end. Again, it can be custom built finish to your own taste, but any painting is additional cost, and embellishments to the cork handle are also additional.